Originally from Northern California, I was brought up around untouched coastlines and never-ending redwood trees. This is where I found my love for the outdoors. Fast forward until now and I’m based out of Los Angeles. As a self-taught writer and photographer, I fell in love with creativity solely through the curiosity of different experiences. This is the space where I feel I belong. In my free time, I travel in my van to different parks creating stories to share with others. This is my way to express my perception of the world. You can read all my stories here: http://jordantarver.com/trip-report. About a year ago, I bought my van. I didn’t know what I was getting myself into at the time. I could only think of my obsession with the outdoors. Camping with my family every summer for as long as I can remember, it was hard not to love it. The 6 of us would pile in one big tent and attempt to not annoy each other. But I’m sure if you asked my mom, she’d have a few words about that. I remember always wanting to help my dad pack the car, but it was always a quick “No.” So, I’d pout, have a few words, kick some dirt around, but eventually find myself sitting on the driveway watching closely. I’d pay attention to his Tetris like method as the gear would slowly fill the back. Just dreaming of doing this on my own one day. That one day is now. I started with a Volvo wagon and I’d pack it tight with weekend essentials - beer, surfboards, firewood, food, and friends. This was just a stepping stone. Next, came tackling my dream of converting my own van. Without owning a single power tool, I somehow convinced myself I could do this. Through patience and tears, I pulled it off. 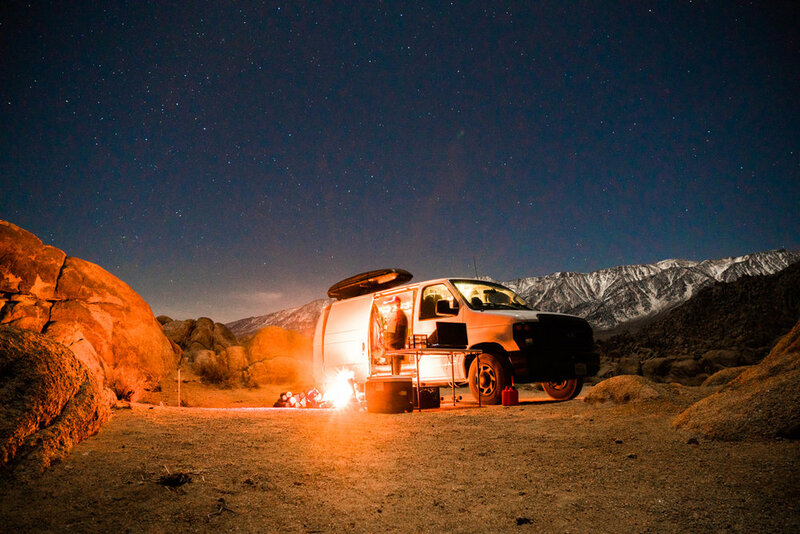 The van has taught me more lessons and taken me to more places I could have imagined. It’s not about how you start but that you started. I started by watching my dad pack the car, and now use his techniques to pack my own van. It’s the things that unfold after the beginning that are the most beautiful. 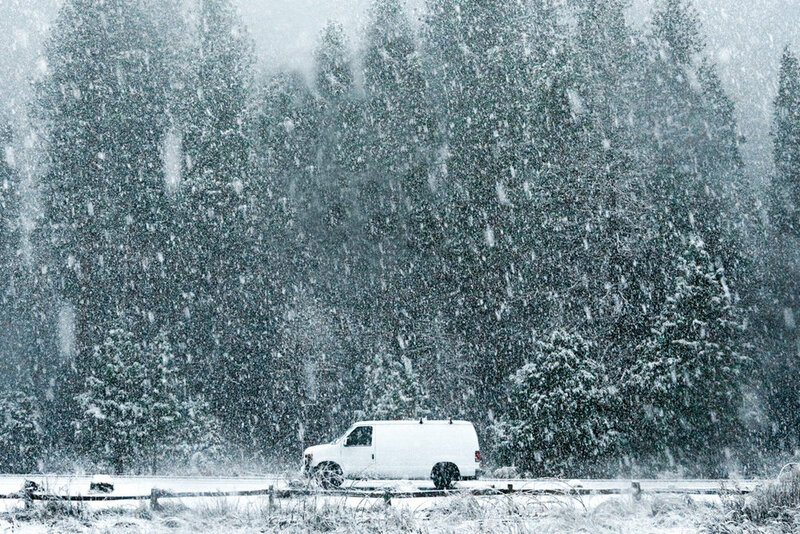 The van is best known as The Story On Wheels (@thestoryonwheels). I’ve never been one to name cars, but the van is a bit more special than your typical car. So, I actually thought long and hard. I thought about all things from the purpose of why I bought it for the message I wanted to convey through the van. I’ve always been a storyteller at heart. Much of what I do – traveling, camping, surfing, exploring – is all around the idea of creating a story. I believe since we are all creators, it’s important to document and share our story with the idea that it could possibly inspire another person alike. I bought and converted this van to create an ever-growing story. So, I found this name to convey that message perfectly. I chose the budget van route. I was in no mindset to spend thousands of dollars or make it livable. I wanted to create a van for surf trips and short road trips. I never had the intent to live in it, that’s just a big pond to jump in. First off, I sold all the work gear that came with the van, which was incredibly clutch. I think I profited around $600 - $700 from all that equipment. This helped me get going on the build quickly. I started my deep cleaning the inside shell of the van, removing all rust, and filling any holes on the floor to prevent water from coming in later on. Next, I use denim insulation against the walls, which I most likely could have done better. Denim insulation is insanely cheap. I think I spent about $40 for the entire van. However, I never expect to be in freezing situations in my zone of the country, so I didn’t focus too hard on this part. To cover the walls of the van, I bought 8’ x 4’ wood paneling from a hardware store and cut it to size. Remember, measure twice and cut once. Seriously. These ran me about $25 a pop plus the stain I bought to stain them. One of my main goals was to give this van a really homey feel. So, I went with decided to go with carpet for the floors. After searching Craigslist, I found someone selling a large roll of tan shag carpet for $70. Give it the 1970s feel will ya! This stuff is sick. I made a stencil of the van floor using large art papers and cut the carpet to size. It fit like a glove. After getting the walls and floor down, came the more difficult part. Deciding the features I would build for a bed, table, and storage. I decided to build an RV dinette style bed/table combo. This gave me storage under the seats, a table to eat at, and converted into a bed. This dinette probably ran me about $150. But, I’m all about storage. I wanted more and had a bit more room left in the front portion of the van. So, I sketched out a cabinet unit in my journal and went to town. This combines a counter space, cabinets, and a pullout stove for outdoor cooking. It honest worked perfectly and supplies ran me about $200. All in all, I’m in love with how my build came out. Keeping in mind that I wanted it to feel comfortable for all parties, I built something exactly as I wanted. Not only that, but it was extremely cheap and easy. I had no prior woodworking experience and didn’t even own a single power tool. My most recent trip was a three-day strike mission into Yosemite Valley. I gave myself a personal assignment to chase a storm heading toward Yosemite Valley. Leading up to the trip, the weather was changing daily and I wasn’t sure if I was going to score. The night before we left, a high weather advisory was rolled out for snow up to 13 inches. I really believe traveling has been the catalyst to my personal growth; it’s opened me up to understanding my deepest desires and enhanced my perception of my surroundings. The benefits I reap from the challenges I overcome are quickly implemented into my daily life. I do all things with purpose and I pay attention to more details than your average person - whether that is details of a rock or details of an individual's values and personality. Those things are all very important to me. The details I absorb while traveling help me live a more defined life that is in line with myself. Everything I’ve taken from traveling has opened me up to a new world and new doors I never knew existed. I wouldn’t have grown into the person I am today without travel. I am a writer for an online publication that specializes in small businesses. I also did freelance web design for the time period I was building out my van to have some extra funds for the project, which I now no longer do. I think it’s important to know and understand your strengths. Spend some time to come in tune with that. We live in an era where we all have the opportunity to make money doing pretty much anything, meaning you can do what you love for a living. Lot’s of jobs are remote now and there are even more freelance opportunities out there. Find your craft and elevate it. The biggest tip for vanlife would be to go into with patience and the understanding that it’s an ongoing project. Your rig will never feel complete; there will always be something you want to update or change. It’s apart of the process and it’s what keeps it interesting 24/7. That shouldn’t scare you, but I think it’s worth noting.